With these EASY silk wedding flower ideas, you'll see how you CAN make your own simple, yet elegant, wedding flower centerpiece and reception table arrangements with silk flower stems. Here you'll find enhancement tips, ideas for variations, and pictures of stylish design examples for creating uncomplicated fresh and silk wedding flower arrangements. There are also tips on making silk flower bundles and drop-ins, which you can create and store well in advance of the big day. You can even use the bundle technique to make a bridal bouquet or throw bouquet for yourself. Of course, the silk flower arrangement ideas you find here can apply to any celebration — Engagement, Anniversary, Bridal Shower, Baby Shower, Mother's Day, Birthday — for which you want to make your own floral decorations. I know this example is very obvious, but it is important because it happens to be in stride with a popular floral design trend in which floral arrangements exhibit a classic, fresh-cut garden look. To make your own trendy silk wedding flower arrangement in it's simplest form, all you need is 7 to 12 silk flower stems of one variety, all of the same color, to place in a plain, clear glass or plastic vase. Try to buy stems with large blossoms and some leaves, as in the pink Dutch Tulip arrangement (15 inch height) at top, left. Notice how the attached, large leaves fill the vase and serve as a backdrop to enhance the colorful blossoms. The red Dutch Tulip floral centerpiece at bottom left shows a slight variation in which the leaves and blossoms lean outward and are spread more apart. See the effect which only a small change can have? 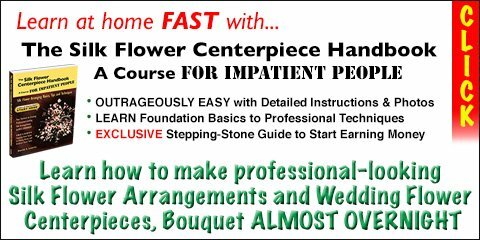 Either way, in minutes you have created a quick, easy and elegant silk wedding flower centerpiece! If you don't have time, or don't want to make your own wedding flower decorations, there are fabulous Ready-Made (also called Pre-Made) artificial and silk flower arrangement displays now available that are truly amazing. Pictures on this page are examples of pre-made faux floral artistry. If the thought of ten to twelve of the same simple silk wedding flower design sounds uninspiring, why not create variations in pairs containing six stems each? For example, with a dozen pink Tulips you could make 2 arrangements with 6 stems each. With a dozen white Roses you could make 2 arrangements with 6 stems each, and so on with a dozen purple Ranunculus, etc. Add some silk greenery to fill out the designs. Display them in classy glass containers — you could have a different vase style for each flower variety. Spread these throughout the reception hall, and the overall effect is pleasing, refined and unified. If you want to spice things up by combining a few flower varieties and colors, visit this easy guide to color combination ideas. A single color (monochromatic) floral display can be very interesting with a combination of different shapes and sizes to entice and delight the eye. At left is a very classy presentation for a silk wedding flower table arrangement. It's a medium-sized (about 13 inches high) combination of white or cream flowers — a mix of small and large blossomed flowers, with some sprigs of greenery — in a low glass container. This one has large Lilies, a central stem of Hydrangea (snowball), and a stem of Queen Anne's Lace (top right). You could substitute Lily of the Valley instead. This is Elegance! Don't you agree? Could you make something like this? Of course you could! How can you make a low reception table arrangement? If you answered, 'one way is to just cut the stems shorter', you are right! Here is a small (but cute!) display of pink Rose blossoms, with the green stems trimmed to about 3 inches long. It measures about 5x5 inches, but makes a lovely little table accent. For a fuller bouquet with a bit more height, add a few more stems, use a larger round glass bowl, trim stem length to about 6 inches (blossoms add about 2 inches beyond this, so total length would be 8 inches) and insert at angles, with the blossoms resting over the rim of the bowl. Before trimming, be sure to measure stems so they will touch the bottom of the vase when in position. This ready-made water garden design measures about 8 inches high. Notice how the stems crisscross within the glass bowl, providing visual interest and giving an impression that this is an 'arrangement'. The picture examples above are pre-made faux flower arrangements set in illusion water. Buying a ready-made silk wedding flower arrangement or pre-made artificial water garden display will save you time, but will be more costly than if you make it yourself. The 'water' is actually an acrylic solution which dries clear and rock-hard (commonly called Illusion Water). Yes, you can buy Illusion Water kits and do it yourself. I'm sure you realize that you will be making a permanent floral design — the silk flowers and vase will be forever joined together with the acrylic. Be sure to follow instructions carefully, and be aware that the process may be influenced by the atmospheric conditions where you live. So allow for extra drying time, and be patient. But here is a short-term display option: while most artificial flower stems are not manufactured to be displayed in water in a clear container for long periods, you could probably do so for an evening without negative results. This is suggested for plastic stems only, not for stems that are hand-wrapped with floral tape. The drawback here is that stems are not secured in place, and will likely shift or even fall out if not handled carefully. Or, instead of water, another idea would be to surround the stems with clear or colored glass rocks or pebbles — quite a nice effect in a plain plastic or glass vase. One advantage is that they can help to keep the stems in position. A Bundle or Drop-in is a group of loose stems tied together with a short length of twine, raffia or ribbon. It can consist of a single flower variety or a coordinated selection of flowers and foliage, or even just foliage and branches. They are available pre-assembled by the manufacturer, although it's certainly easy enough to make your own drop-ins. In the pre-made Narcissus bundle (15 inches high) pictured here, notice how blossom heights vary, and that one leaf on each side was folded downward to embrace the stems — a neat artistic touch! Wouldn't this be a nice hand-tied silk wedding flower bouquet for you? Stem ends usually meet evenly across the bottom. For bundles of pleasing girth, I suggest grouping no less than 7 silk flower stems. Wrap raffia, twine, or ribbon around the stems several times to your liking, then tie with a knot or small 'shoelace' bow. After tying, trim the tail ends very close to the knot. Go ahead — mix flower varieties, experiment with uneven quantities, such as 3 Rose stems and 5 Ranunculus stems. If using one type of flower you can use mixed colors, such as 3 pink, 3 cream and 2 red Roses. Be sure to include a bit of artificial foliage to help colorful blossoms stand out. For tall displays, such as the 36 inch tropical silk flower drop-in shown in picture at left, you can use larger mixed floral and foliage elements, but fewer stems. These can be displayed in clear or opaque containers. Wouldn't this look great in that glazed porcelain bamboo vase shown alongside? This would certainly make an impressive and unique silk wedding flower arrangement! Remember that different kinds of containers will influence the character of a floral display — short, tall, brassy, classy, shiny, dull. Choosing one is part of the art, so be sure to give some thought to this important design aspect. So, you see, you can make your own silk wedding flower bundles way ahead of time, store them, and be all set to 'drop-in' to a container when ready. Also, based on the ideas presented here, you could make an easy — yet stylish — silk wedding bouquet, in the hand-wrapped, hand-tied, or arm bouquet style. Visit this article for advice and pictures of bridal bouquet styles and popular wedding flowers used in bouquets and floral arrangements for ceremony and reception. Making silk wedding flower decorations yourself doesn't get much easier than this — go ahead, give it a try! Feeling creative? Here is a link to photo-illustrated, step-by-step instructions for how to make a simple, classy silk flower centerpiece in FIVE easy steps! Below are examples of some Pre-Made artificial floral arrangements that could be proudly displayed at a wedding or banquet reception. If you want quick-and-easy, I suggest setting them out as is, with a little simple enhancement. You could sprinkle a handful of loose flower petals, potpourri or confetti on the surrounding table surface. If a pre-made design is available in several colors, you could vary with 2 or 3 colors of the same design among the reception tables. Or, mix 'n match different designs that are set in similar glass vases. 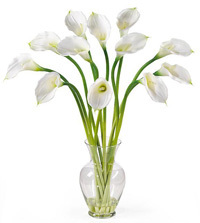 This 29 inch silk Calla Lily arrangement features 12 artfully arranged stems, posing gracefully in a classic glass vase with artificial water. It would make a charming display in any setting, and can serve nicely as a silk wedding flower arrangement for ceremony and reception, or as a banquet table centerpiece for any celebration — anniversary, engagement, retirement, luncheon, formal dinner...you name it. Bold, yet simple sophistication best describes this contemporary black and white floral centerpiece. 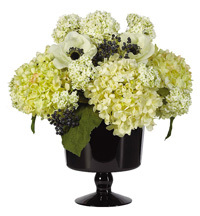 Bursting Hydrangea blooms, surrounded by lush green leaves, gracefully drape the sides of the container. The crisp, creamy colors are the perfect match to the handsome black vase. This grand 18 inch creation makes a stylish and distinctive table centerpiece for any celebration — wedding, engagement, anniversary. 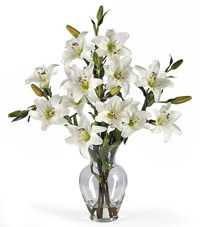 This 23 inch silk Lillium Lily liquid illusion arrangement has both full and budding blooms on 5 stems, and perfectly captures that just-picked look in a clear glass vase with the artificial water. This large-blossomed beauty is perfect as a wedding ceremony flower arrangement, or as a table centerpiece for wedding reception, anniversary, engagement — or any special event. I hope these silk wedding flower ideas have given you some inspiration. Floral centerpieces don't have to be complicated — a simple, clean, classic display can be very alluring in its own way. Want More FREE Silk Flower Coaching? Sign up now for Silk Flower Smart NEWS to receive email notification about NEW silk flower crafts instructions and articles, floral product reviews and recommendations from Silk-Flower-Smart.com.